At one time, religion in Kenya was represented by dozens of tribal beliefs. Today, Kenya has lost its religious diversity and is now a predominately Christian country (at least nominally). The Muslims number around 10% of the population, and are especially located in the coast area around Mombasa. At the same time, many Christians and Muslims mix their main religion with traditional African beliefs. Due to the impact of Christian missionaries during the British colonial period of Kenya's history, the majority of Kenyans today are Christian. Approximately 45% of the population are Protestant and another 33% are Roman Catholic. There are more than 4,000 registered churches in Kenya, from a mix of denominations such as Anglican, Methodist, Baptist and a variety of newer Pentecostal churches. The ongoing missionary work by Christians in the poor and rural areas of Kenya, continues to increase the number of new Christians. 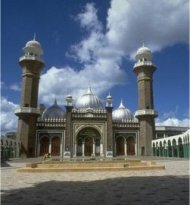 The next largest religion in Kenya is Islam, with about 10% of the population. Though Islam can be found all through the country, the majority of Muslims live along the coast, especially around the city of Mombasa. The religion came to Kenya through the Arab traders who established communities near the ports. The Somali tribe lived in that area when the Arab trading was at its peak, and today are predominately Muslim, both in Kenya and Somalia. The spread of Christianity has largely eliminated many of the traditional and tribal beliefs held by the people of Kenya, prior to contact with Europeans. Tribes who most closely continue to live in their traditional ways, are the ones who also still hold their old beliefs. Christianity has not made much headway among the Samburu, Turkana or the Masai tribes, particularly. Overall, about 10% of the population still follow their African religion in Kenya. For the most part, each tribe has its own set of beliefs, usually tied somewhat to their territory. Tribes that lived near Mount Kenya, for example, often believed that God lived at its peak. Like Christians, Kenyans originally believed in a single creator God. "Ngai" or "Were" are common names for God, though not the only ones. Each tribe had its own creation myth, which usually attributes their tribe as being directly created by God. Even Kenyans who identify themselves as Christian may continue to hold beliefs based on their traditional spirituality. Various superstitions, particularly about ancestral spirits or even witchcraft still exist. 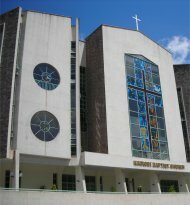 Even mainstream churches sometimes follow a blended form of religion in Kenya, in order to bring in more converts. There is only a very small portion of the population that follow another religion in Kenya. There are followers of Hinduism, Sikhism and a few other Indian religions. These beliefs came to Kenya primarily through traders (like the Muslims) but also through the Indian workers who came to the country to build the Uganda railway. Many of these workers stayed in Kenya, and their beliefs still persist even though in a large minority.